The long QT syndrome (LQTS) is an inherited cardiac arrhythmia characterized by a prolonged heart rate–corrected QT interval (QTc) on the surface electrocardiogram (ECG). It is associated with syncope and sudden cardiac death from torsades de pointes, and is estimated to affect 1 per 2000 individuals. Fifteen genes have been implicated in familial LQTS, most of which encode cardiac ion channels or channel-interacting proteins. To date, mutations in the KCNQ1, KCNH2, and SCN5A genes (causing LQTS 1, 2, and 3) have been found in about 70% of cases, while mutations in other genes (LQTS 4–15) are found in only 5%, indicating that for ~25% of cases the genetic cause remains unknown. Novel CALM3 mutations in pediatric long QT syndrome patients support a CALM3-specific calmodulinopathy. Chaix, Marie-A. et al.,HeartRhythm Case Reports, Volume 2, Issue 3, 250-254. In this study we describe 2 gene-elusive early-onset LQTS subjects, showing sinus bradycardia in utero and profound QT prolongation after birth (QTc intervals >600 ms). Based on this extreme LQTS phenotype and the negative family history, we expected the causal variants in these subjects to be de novo and to negatively impact protein amino acid sequence and function. We carried out a sequencing study of these subjects and identified 2 novel variants in CALM3 potentially responsible for the LQTS. 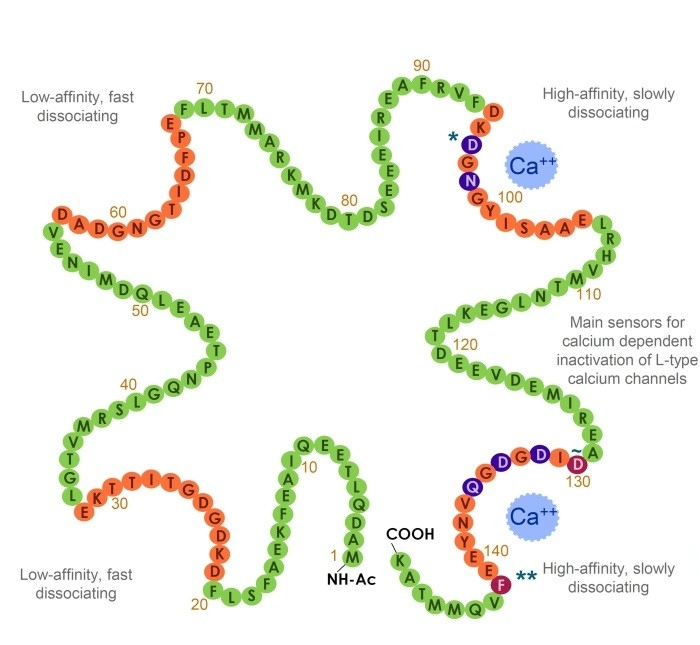 The human genome contains 3 distinct CALM genes (CALM1, CALM2, CALM3) located on different chromosomes that encode identical ubiquitously expressed calcium-binding protein calmodulin (CaM). Multiple de novo mutations in the 3 calmodulin genes have been described in infants with severe early-onset long QT syndrome (LQTS), all of which are located within the C-terminal Ca2+-binding motifs of the protein. An LQTS-specific “calmodulinopathy” phenotype associated to calmodulin mutations has been described with a very early onset of the disease (average age of onset: 3.7 years), with fetal or neonatal presentation of the disease described in 50% of cases. CaM-encoding genes should be considered for genetic diagnostic testing of patients with LQTS, especially in young patients with severe symptoms. 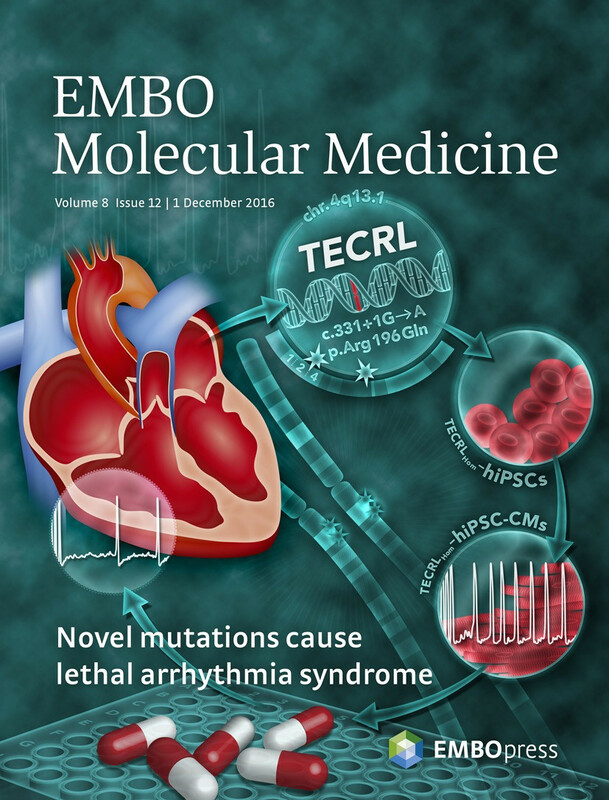 We also presented the clinical phenotype of patients from three different families with exercise‐induced arrhythmias and identified mutations in the gene, TECRL by whole‐exome sequencing. We generated human induced pluripotent stem cells (hiPSCs) from an affected patient and differentiated these to cardiomyocytes (CMs). We uncovered electrophysiological and calcium‐handling abnormalities in CMs with a TECRL mutation compared to hiPSC‐CMs generated from an unaffected family member. Moreover, mutant cells were prone to an increase in triggered electrical activity upon catecholaminergic stimulation with noradrenaline. This could be partially rescued by treatment with a class Ic antiarrhythmic drug, flecainide. TECRL, a new life‐threatening inherited arrhythmia gene associated with overlapping clinical features of both LQTS and CPVT. Devalla, HD et al., EMBO Mol Med. 2016 Dec 1;8(12):1390-1408. Sudden cardiac death (SCD) continues to be one of the leading causes of mortality worldwide, with an annual incidence estimated at 250,000-300,000 in the United States and with the vast majority occurring in the setting of coronary disease. We performed a genome-wide association meta-analysis in 1,283 SCD cases and >20,000 control individuals of European ancestry from 5 studies, with follow-up genotyping in up to 3,119 SCD cases and 11,146 controls from 11 European ancestry studies, and identify the BAZ2B locus as associated with SCD (P = 1.8×10(-10)). The risk allele, while ancestral, has a frequency of ~1.4%, suggesting strong negative selection and increases risk for SCD by 1.92-fold per allele (95% CI 1.57-2.34). We also tested the role of 49 SNPs previously implicated in modulating electrocardiographic traits (QRS, QT, and RR intervals). Consistent with epidemiological studies showing increased risk of SCD with prolonged QRS/QT intervals, the interval-prolonging alleles are in aggregate associated with increased risk for SCD (P = 0.006). Identification of a sudden cardiac death susceptibility locus at 2q24.2 through genome-wide association in European ancestry individuals. Arking, DE et al. PLoS Genet. 2011 Jun;7(6):e1002158.